I spend a great deal of time trying to convince people to invest in musicians on Bandcamp. But there was an extended period where I wasn’t putting my money where my mouth was. It was past time to remedy that. If I’m going to beg for artist support, I figure I’d best support the artists! To that end, here are some recent purchases made via my favorite app. Needless to say, there are plenty more where these came from. These are not necessarily new releases. For the sake of simplicity, let’s call them “new to me,” and take it from there. I stumbled across this band and its glorious indie sound a couple of years ago via their album Dealer. Not only was their music cool, but they were from St. Louis! How I’d missed them I wasn’t sure. The band’s latest effort, Nearer My God, is a musical step forward. The sound is a bit more sophisticated (read, produced), but still maintains its indie credibility. This is a band headed for bigger things, if the show I saw recently at Delmar Hall is any indication. My love for Boston-based Bent Knee is no secret. The sextet brings so many musical elements to the table, I’ve often wondered what each member would sound like apart from the others. Lead vocalist/keyboardist Courtney Swain helped answer that question. Growing Pains finds Swain’s achingly beautiful voice more isolated, ethereal and haunting. In this setting, she is augmented only by her keyboards, strings, and backing vocals. These songs feel more intimate and personal, a most interesting diversion from her regular gig. The Fierce and the Dead might hail from England, but their new album comes out sounding like Southern California “Stoner Rock,” full of crunch and groove designed to be heard while driving fast on the open highway with the top down. But this band keeps its groove lyrics free, and lets their music do all the talking. Of course, there are a few tricky prog elements here and there as well. The Euphoric is a fun-filled journey that keeps heads banging and feet stomping, sometimes between the beat. Like in jazz, progressive rock musicians tend to move from project to project, all but assuring interest based on name recognition alone. I was already a big fan of two thirds of the Lighthouse project, namely guitarist Mark Wingfield and touch guitarist Markus Reuter. And while they more than hold their own throughout this project, I couldn’t get enough of the drumming of Sirkis, who establishes the groove early, and never relinquishes command. The rest of the band falls in around his rhythmic suggestions, and improvisational magic follows. Name recognition strikes again, as I am a huge fan of drummer Marco Minnemann thanks to his efforts with Steven Wilson and the Aristocrats, among others. 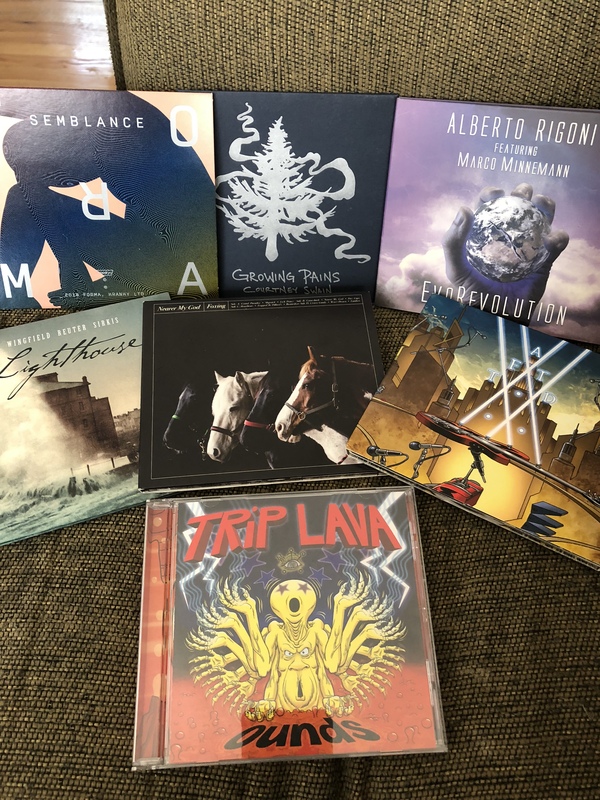 But this project is the brainchild of bassist Alberto Rigoni, a highly inventive musician with the chops to create a record based solely in the sounds of bass and drums. Experiments like this can come off as reckless or self-indulgent, but the two musicians do a great job of sharing the spotlight, making great music together while staying out of each other’s way. Forma’s music seems related on some level to that of keyboardist Richard Barbieri meeting with Brian Eno, with ambient and sequenced sounds forming a lush soundscape. The music is both tasteful and textured, leaving itself open to interpretation while establishing its own identity. This is a prime example of foreground/background music, which allows you to take in as much or as little as you like at any given time. A highly experimental one-man band, Trip Lava takes the abstract and bends it into all kinds of interesting shapes and sounds, which seem to come from everywhere. Multi-instrumentalist Joel Lee takes a variety of sounds and runs them into a four-track recorder, creating all manner of loops, melodic lines, chords, and samples culminating in music that is both abstract and familiar. If this is what happens with four tracks, one can only imagine what might happen with 16 or more! There’s much more where this came from. I look forward to sharing more discoveries with you in the near future. Check out my new book, I Can’t Be the Only One Hearing This: A Lifetime of Music Through Eclectic Ears. It’s available from Amazon, Barnes and Noble, and other fine bookstores. Previous One Book. One Reader. Two Viewpoints. An entertaining trip through the hinterlands of new music. The standout piece for me was Courtney Swain’s Moonstalker. Nice to hear her singing sweetly. Keep ’em coming, Cedric.